The week before last (I can’t believe it was that long ago now) we popped over to Prague for a long weekend. If you’ve never been to Prague all I have to say is…go! Go now! It’s such a wonderful place. The history, the architecture…the beer. Oh the beer. If you stay around the city centre you’ll tend to find 3 beers: Pilsner Urquell, Budvar and Krušovice. Not that that’s a bad thing: far from it! But Prague is absolutely jam packed with microbreweries and it doesn’t take a long stroll to find somewhere tucked away with a delicious selection of rare brews. One of these places is the Strahov Monastery, just over the Charles Bridge and high up on the hill (once you’ve climbed it you’ll deserve a pint…or half a litre anyway). The monastery is stunning to behold and a wonderful backdrop for when you’re sitting outside the brewery, which has an intriguing history of its own, housed in buildings dating from 1142. The first evidence of brewing on the site is documented as being on the turn of the 13th and 14th centuries. However, the brewery was closed in 1907 and only reopened in 2000 after extensive refurbishment. While the monks are not involved in the brewing process, the beers are still named after St Norbert. There are two main brews, the usual light and dark beers and then additional special and seasonal beers. Unfortunately we were too early for the Christmas ale; I love me a Christmas ale, but the rest did not disappoint. Look at those dimpled jugs. Look at those enormous, creamy, frothy heads. Look at the colour of those beers! I’m salivating just looking at this picture. One thing I love about dark Czech beers is that you get all of that flavour without the sky high ABV. This malty dark lager was bursting with the aroma and taste of roasted nuts and caramel, but with a pleasingly bitter edge. 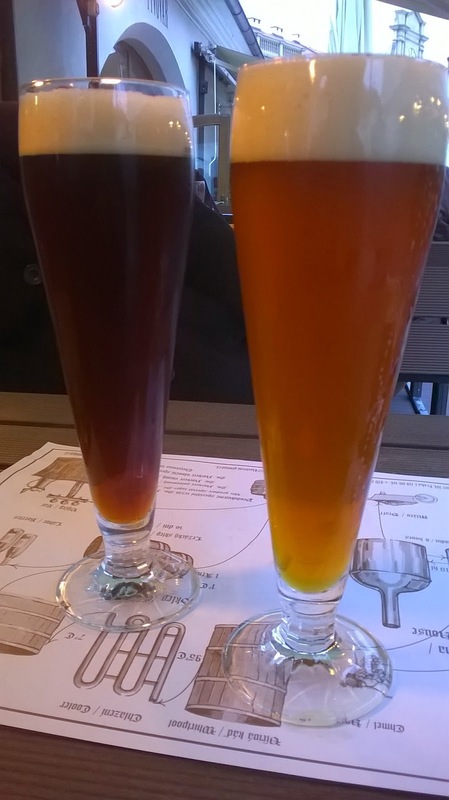 The amber beer was no less appealing; a cloudy dark orange with a flowery aroma. The body was heavier than I anticipated, but that was no bad thing, especially on a colder day. There was a mild bitterness, but it wasn’t overpowering. Another drinkable number. But what was this? An IPA on the menu? Made with 2 types of American hops? In a Czech microbrewery in the grounds of a monastery? IT’S LIKE ALL MY DREAMS HAD COME TRUE. Let’s start with the November Brown Ale, a rich and savoury beer with hints of sweet caramel, very similar to a typical American style brown ale. Delicious, but an acquired taste and a little bit heavy for a session beer. The IPA on the other hand…dear god. Packed with hops that you could smell a mile off (Amarillo and Cascade) and a strong bitterness, it was an outstanding example of the style. Strong citrus notes came through with hints of peach bringing a tiny bit of sweetness back to the palate. I had a couple of these and, to be honest, I could have had a good few more, although at 6.3% you probably don’t want to be knocking back too many. 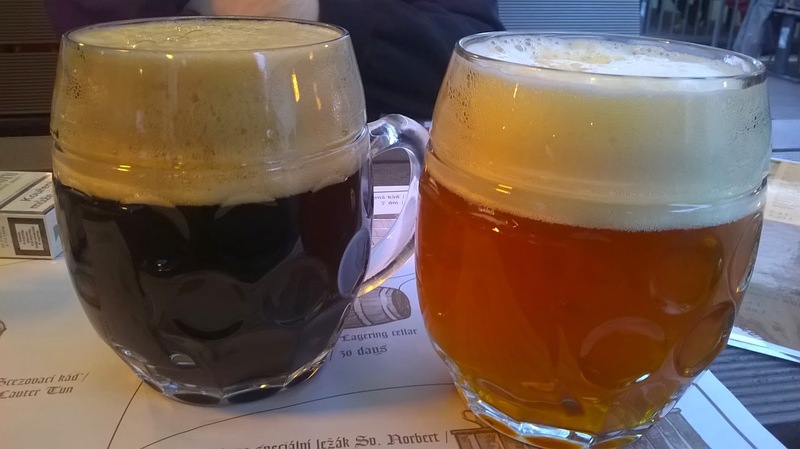 Have visited Strahov Monastery Brewery on two occasions now; one in early autumn and one in the depths of winter. Both visits were really good, and as well as trying the Amber, Dark and IPA you describe, I got to sample the Christmas Ale. Will definitely return.